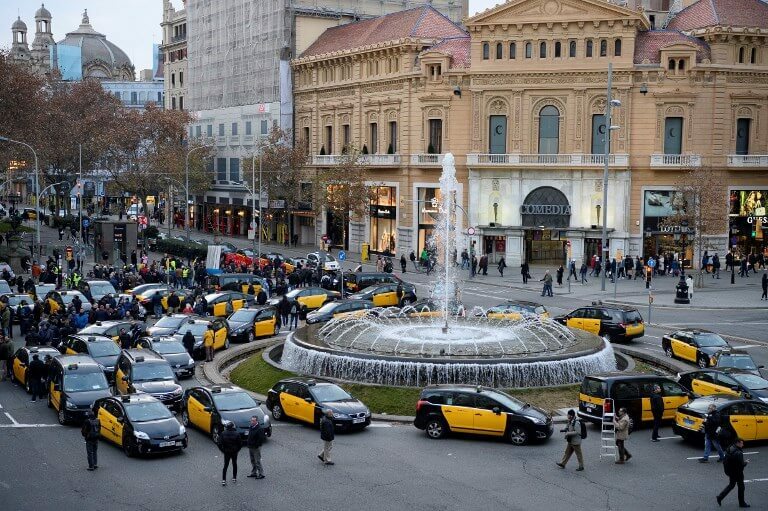 Dozens of taxis in Barcelona have started an indefinite strike, and on Friday blocked the major Gran Via thoroughfare in protest against online ride-hailing services like Uber and Cabify. The mobilisation comes ahead of a similar work stoppage due to kick off on Monday in Madrid just two days before the Fitur International Tourism Fair, one of the world’s largest, kicks off in the Spanish capital. ‘From now, us taxis will go on strike indefinitely in the Gran Via,’ a street that crosses Barcelona, federation Elite Taxi said in a statement. Three people were later arrested for disorderly conduct and damages after they tried to block another central street with containers, the Catalonia police said on Twitter. ‘We want them to differentiate both services and the only way to do so is via pre-booking,’ said Luis Berbel, head of the Taxi Union of Catalonia.